There's never a time that I don't think a good ink-blended gradient looks beautiful so that's what we're working on today! Distress Inks (the medium I'll be sharing) blend really easily on watercolor paper, so with that being said, I would recommend using a watercolor cardstock for your envelope base. If you are able to locate already-made watercolor envelopes, you're good to go! 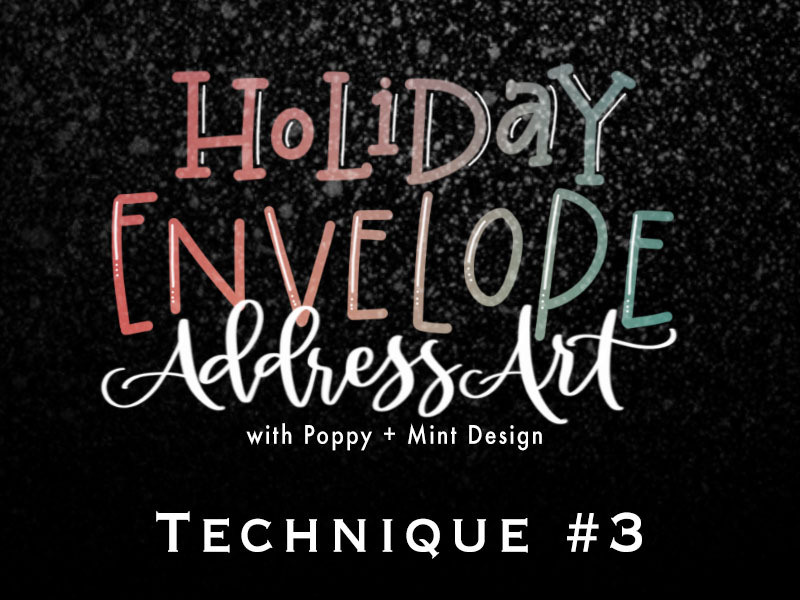 If not, please refer to the steps I showed in the Technique #1 Video on how to use an Envelope Punch Board to create an envelope out of your desired material: Click HERE to view these steps! 2. Tape down all edges of the envelope at the scored seam with 2" Post It Tape. This will act as a mask to protect the flaps of your envelope from ink AND give you a starting point to introduce the ink to the envelope. 3. Have all your inks and their associated Ink Blending Tools ready to go and in hand's reach. You'll be moving back and forth between each of them multiple times in order to achieve a soft blended look. For this envelope, I was going for a sunset look so I started with the light yellow, Antique Linen, at the bottom and worked up to the black, Black Soot, at the top. 4. With your Ink Blending Tool loaded with Antique Linen, start at the bottom of your envelope and first start your blending circular motions on the tape and move onto the envelope. Fill the envelope to about 1/3 of the way up with this light color as the blending you'll be doing in the next steps will start to encroach on it and bring it back down towards the bottom. 5. Once you're happy with the hue of the Antique Linen on your envelope, set that aside (and ready to grab again - I keep the top off of my inks and have them hold the Ink Blender while I'm doing another color so it's easy to go right back to the previous color. Start with the Victorian Velvet the same way - circular motions starting on the tape and entering the envelope above the yellow and filling in a section of this pinkish hue. You'll want to lightly blend along the line with the Antique Linen and then pick up your Antique Linen blender again, grab some more ink, and buff out that line between the two to make it a soft, seamless blend. 6. Repeat this process for all colors up to Black - you'll see in in the video tutorial how I step back down every time to blend out the previous color with the color I'm currently working on. 7. Once the blending is done, you can remove the tape and hit the whole envelope with a heat gun to thoroughly dry the ink. You'll want to make sure that it's completely dry before moving onto the next stamping/embossing step and to do this, you can check by tapping some embossing powder onto your surface and seeing if it falls off or if it sticks to the ink. If it sticks, brush it off with a dry paintbrush and then continue to dry more. 8. Once you're confident the ink is completely dry, take your EK Powder Tool and prep your envelope by covering the whole area with the powder. This will eliminate static cling and assist the embossing powder in just sticking to your stamped images. 9. Take your stamp of choice (I chose Merry & Bright from the linked stamp set but you could use a full background stamp, a stencil etc.) and mount it to the acrylic block. Using Versamark Ink, stamp your envelope in the pattern you like. I first attempted to be very straight and staggered in my stamping but that proved to be hard and it started to go awry! No worries! Just make the decision to have your stamping look uneven and asymmetrical on purpose! :) I also left the area where the stamp will go bare to make sure that it can still adhere to the envelope. 10. I did my stamping in waves, where after 2 or 3 stamps, I would stop and apply my clear embossing powder so I could see where I had already stamped. After completing the entire envelope this way, use your heat gun to thoroughly melt the embossing powder of all the stamps. 11. For added texture, take a spray bottle of water - I used a Distress Sprayer because it gives a good variation of a mist to bigger droplets - and spray your envelope. Wait about 10 seconds and then dab at the envelope with a paper towel to pick up the water and the ink that it has reactivated. This effect almost looks like bleach spots and it will really make the stamped areas pop out because the ink under the stamp has been trapped in and won't be removed! 12. I used Adobe InDesign to create an Address Sheet that I could print out on my printer, on a cardstock color of my choice, and then trim out each 3.75"x2" rectangular and adhere it to my envelope. Easy Peezy! If you have Adobe Suite and are versed in using InDesign, here's a download link for that InDesign File! It's created using an 8x10 page with the bleed settings set to equal a standard Letter Size Page. Therefore, when you export to PDF, make sure that under Marks and Bleeds on the left, that "Crop Marks" is checked to print. Once printed, you can trim along the crop marks and then use the dimensions of 3.75" long and 2" high to complete your trimming. Feel free to email me with any questions! 13. After adhering your address block with Tombow Mono Permanent Tape Runner, you can add one extra detail using the Pilot Envelope pen to add some black faux stitching to the address cardstock piece. Next, adhere your stamp to the upper right and take the Distress Glaze and with a little bit on your finger, seal up the entire envelope where Distress Ink is showing. This will protect it in the mail and make it be waterproof! Thanks so much for following along and I apologize for the schedule delay I announced yesterday! I hope you enjoy Technique #3 and #4 (also posted now!) and I'll be back on Tuesday with the final Techniques #5 and #6!